Earlier this year I had the amazing opportunity to spend my Spring semester studying in Florence, Italy. After spending my Sundays as a child visiting my Italian great grandparents and four+ years of studying the language, I anxiously waited for the day when I could visit the nation of my ancestors and put all my years of study to practice on the streets. Even more, I looked forward to the chance to live in the country whose cuisine I worshipped. I knew before I even left the United States that concerns about the scale would be left at home. Only four months in a country with such delicacies as tiramisu, bolognese, pizza and gelato meant that there was absolutely no room for guilt. Food was a constant fixture on my mind, in part because of my foodie tendencies, but also because I was enrolled in a Molecular Gastronomy course focusing on food chemistry. Some of the greatest benefits of the course were the various fields trips to extend our lessons beyond the classroom. A visit to a Chianti vineyard, a goat farm and a chocolate factory were all wonderful, but my favorite was a trip to the small town of Montespertoli for a cooking class. Growing up, I loved watching my family members cook in the kitchen, so this cooking class enabled me to learn some of the tricks of the Italian trade. On the class menu: assorted bruschetta, handmade spinach ravioli with sage butter sauce, handmade gnocchi, roasted pork with milk, and tiramisu. Amongst everything on the menu, the gnocchi were the most time-consuming, but the results were incredible. Perfect gnocchi are like pillows, soft and delicate. There are so many aspects in the preparation process that can quickly turn a batch of fresh of gnocchi from exemplary to inferior, so preparing the light pillows requires plenty of patience and practice. However, for those days when deadlines and reading assignments pile up and you just can’t face them, rolling gnocchi is an ideal way to procrastinate. This recipe is adapted from the Salati Bene cooking class I took while in Florence. The original measurements were in metric, so I have converted them here. Typical of Italian cooking, the original “recipe” was less than a recipe and more like a brief outline of instructions. Since a cup of flour can have different meanings depending on who you ask, I have updated the recipe based on personal experience with further details about what to do with each step. Fill a large pot with water and bring to a boil on the stove. Once boiling, salt the water and add the potatoes to the pot. Bring the pot back to a boil and cook until fork tender (the time will depend on the size of the potatoes, but begin checking close to 40 minutes). Once cooked, remove the potatoes from the water with a slotted spoon. While still warm, carefully skin the potatoes. It is important that the potatoes stay hot so that they can be easily mashed. Once peeled, use a ricer or a food mill to mush the potatoes. If you lack these tools, simply mash them with a fork in a bowl. Be careful not to over mash the potatoes; just ensure that there are no noticeable lumps. 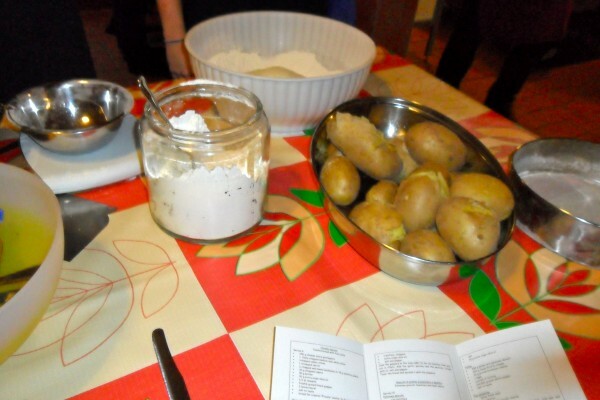 When the potatoes are ready, place the potato pulp in a bowl and add the flour and cheese. Grate in some fresh nutmeg to taste, then season with salt and pepper. Without overworking, carefully combine the mixture to form a dough. Gently beginning kneading the dough as one would with bread. Press down and away with the heel of the hand, fold the dough over, make a quarter turn, and repeat the process. Add additional flour, if needed, to keep the dough from sticking. Be careful not to add too much flour at the risk of making the gnocchi too dry. Knead into a ball until the dough is moist but not longer sticky. Once the dough is ready, divide it into five or six smaller balls. Roll each ball into snake-like ropes of dough, about finger thick. Proceed to cut the rope into one-inch pieces of gnocchi. 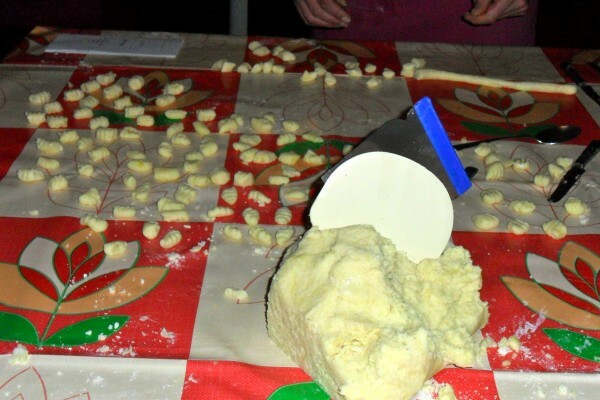 From here, the gnocchi can be boiled, or shaped to resemble the traditional Italian version by using the tines of a fork to add ridges. Place the gnocchi at the top of the fork against the tines, and gently press it against the length of the fork. Do not press too hard, or the gnocchi will collapse. Shaping the potatoes will require practice, but the more one does it, the easier it becomes. As each pillow is done, place in an even layer on a lightly floured baking sheet. 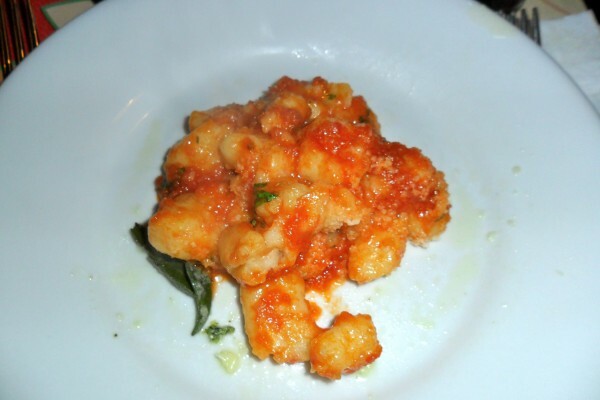 To cook the gnocchi, place in a pot of salted boiling water. The gnocchi are finished when they rise to the surface of the water. This should only take a few minutes, but time will vary according to size, therefore it is best to watch them. Remove from the water with a slotted spoon. Serve with your favorite tomato or pesto sauce, or try substituting them for the pasta in your favorite Italian dishes. Categories: Blog, Campus Cooking, Eating, and Recipes. I'm Cooking For...: Dates, Dinner Party, and Valentine's Day. At what point would you recommend freezing. After shaped and on the floured baking tray? Excited to try! !